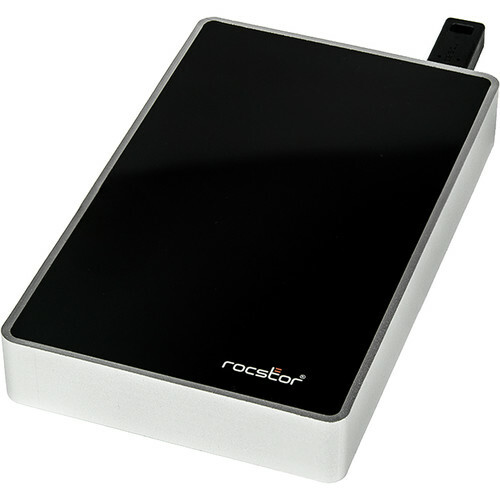 Keep your data safe at all times with the 2TB Rocsecure EX31d USB 3.1 Encrypted Portable 5400 rpm HDD from Rocstor. Equipped with a FIPS 140 Level-2 and NIST certified cryptographic processor, this portable drive provides AES 256-bit real-time hardware encryption along with token-key and keyboard-password authentication. The cryptographic processor performs full-disk encryption, protecting your entire data at rest. The full-disk encryption (FDE) solution is OS independent with no extra software or driver components needed. Included in the package are three standard token keys. The EX31d is engineered to encrypt/decrypt the entire SATA HDD including the boot sector, temporary files, and operating system with SATA III speed at 6 Gb/s. The drive offers enhanced security, performance, and speed with FIPS 140-2 level-2 and NIST cryptographic processor certifications. The Rocsecure EX31d combines token key authentication with password validation via the host computer's keyboard for advanced security. The CryptoKey token key system manages a confidential communication channel with the encryption/decryption engine. CryptoKey token keys (three included) feature a wide array of defense mechanisms designed to prevent physical attacks on the device as well as logical attacks on the data transmitted between the token key and the Rocsecure EX31d. A token key must be physically attached to the EX31d before connecting the drive to the host computer, otherwise the EX31d HDD volume is not mounted or displayed. The portable ruggedized aluminum enclosure helps to protect your HDD and data. The safety-centric mechanical design of the Rocsecure EX31d's 2.5" enclosure provides critical hardware protection features. The full-length bridgeboard provides protection by supporting the entire length of the drive. A strong aluminum rim holds the drive chassis firmly in place, eliminating stress on the bridgeboard and preventing damage due to impact or violent movement. The shock-absorbent damper strip between the bridgeboard and chassis offers additional resistance against accidental drops and bumps. The disposition of the drive and housing profile form an anti-shock chamber to cushion potential impacts. The precision density of the rugged aluminum aircraft-grade border provides efficient heat dissipation and is strong enough to bear external weight. Rocsecure EX31d employs data encryption and pre-boot authentication allowing organizations to better protect and control access to their corporate and customer records, thus complying with regulations such as Sarbanes-Oxley (SOX), Health Insurance Portability and Accountability Act (HIPAA), and Gramm-Leach-Bliley (GLB). It is also FCC and CE compliant. Together with full-disk encryption and token-key-based authentication, these features give you a high level of protection along with ease of use. The Rocsecure EX31d is OS independent and is compatible with Windows XP, Windows Vista, Windows 7/8/10/, Linux, and Mac OS 10.5 and later. Its USB 3.1 Gen 1 interface is backward-compatible.